I’m quite sad to say that Maze Runner: The Scorch Trials, was nowhere near as fun as the first film. After seeing countless young-adult novels being adapted, I was quickly growing tired of the subgenre. All of them fell short to The Hunger Games, but some were nearly unwatchable. I remember I’d just watched The Giver, and I thought that was the end of the YA phenomenon. But I was wrong. I went into The Maze Runner and had a great time. I thought it was fun, exciting, and fresh. So, like many people, I was looking forward to the sequel—unfortunately I was disappointed. Maze Runner: The Scorch Trials follows the story of Thomas (Dylan O’Brien) and the other Gladers who recently escaped the Maze. They are brought to a secret facility, where they discover there weren’t in the only maze, as other survivors from other mazes were brought there as well. However, it doesn’t take long for Thomas to discover this place might not be the haven it claims to be. 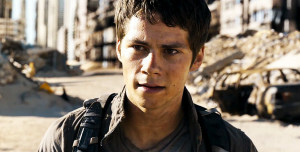 So, the Gladers and Thomas must escape and see what is really out there. This movie, directed by Wes Ball, is a movie that just has the audience wandering. The two hour and ten-minute film is about an hour of solid, fun action. But the other hour, is just repetitive, escape sequences that feel quickly feel generic and just thrown in. I enjoyed the first film so much because it was so thrilling trying to figure out everything going on, they just threw the audience into a story and allowed them to learn and discover with their main character. This movie the audience will be a ten steps ahead of the characters. An hour of Maze Runner: The Scorch Trials, the second act, drags because nothing is happening. Thomas and the Gladers get somewhere, and then they run. They get somewhere else, and they run. There is a destination, but the voyage is just filled with fluff that is almost always useless. For example, there is one scene in particular that I felt could have been completely removed. Thomas and a new friend find themselves at this odd “party” that seems completely out of place. At this point, I was glaring at my watch trying to count the minutes left. With that said, the other hour, which is thirty minutes in the beginning and thirty minutes at the end—those moments are effective. There are things at stake; there is valuable information that makes the moments interesting. Those last thirty minutes are the best part of Maze Runner: The Scorch Trials. Characters are actually doing something other than running. One character makes a vital move that effects all of the Gladers, in a not-surprising, but a successful twist. It was the first time I finally felt emotion in the movie. I felt betrayed and hurt. Then, another great moment happens, as Thomas goes face to face with Ava Paige (Patricia Clarkson). Only if this movie had cut out the 45 minutes of just generic, escape sequences, would have this sequel been as good as the first.